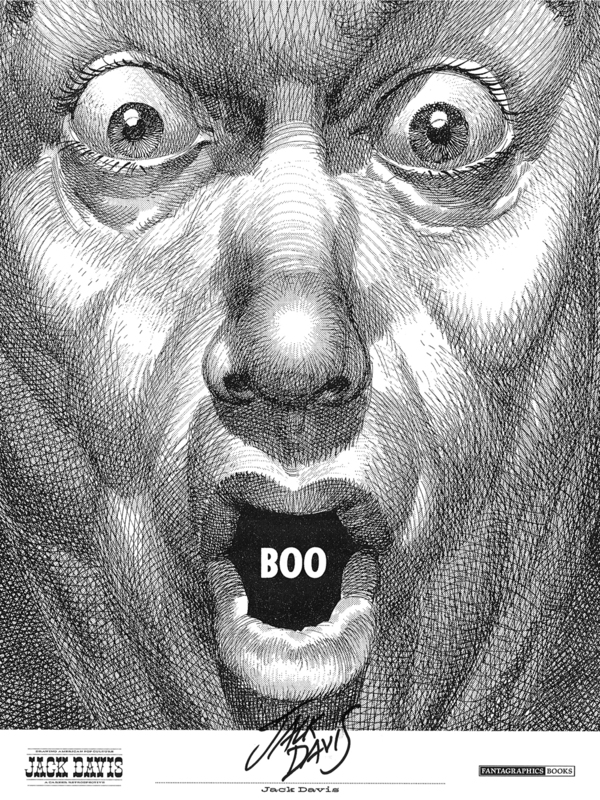 Jack Davis: Boo! | 'TAIN'T THE MEAT… IT'S THE HUMANITY! As this website is almost a year old (our first anniversary is on the 23rd January), and as this is my 75th post, I think it’s only fitting that I mark the occasion with the help of cartoonist and comic book legend Jack Davis. Not only am I a great fan of his work but his 1952 Tales From The Crypt story provides the title for this site. Two months ago I posted a story drawing attention to Seattle publisher Fantagraphics’ Kickstarter scheme to help raise funds to fill the revenue gap caused by the sad death of co-founder Kim Thompson (click here for the link). The scheme was a great success with more than $70k raised above the original pledge target. This input of cash now guarantees Fantagraphics 2014 Spring Collection of books, including those Thompson was working on before his death from cancer in June 2013. Putting my money where my mouth is, I made a $35 pledge and chose a signed Jack Davis print as my reward. I’m happy to say it arrived this morning – and very pleased I am with it too. It measures 9 x 12 inches and is printed on thick card stock. Davis’ fine pen work is printed in great detail and it’s a very eye-catching piece. It should look great when it’s framed and hanging in my office with the rest of my signed prints.